Pierce likes to write letters. He writes to relatives and to his previous teachers. He writes often enough that I went to Michael's and stocked up on a variety of $1 stationary for him. They have some really cute inexpensive stationary there. 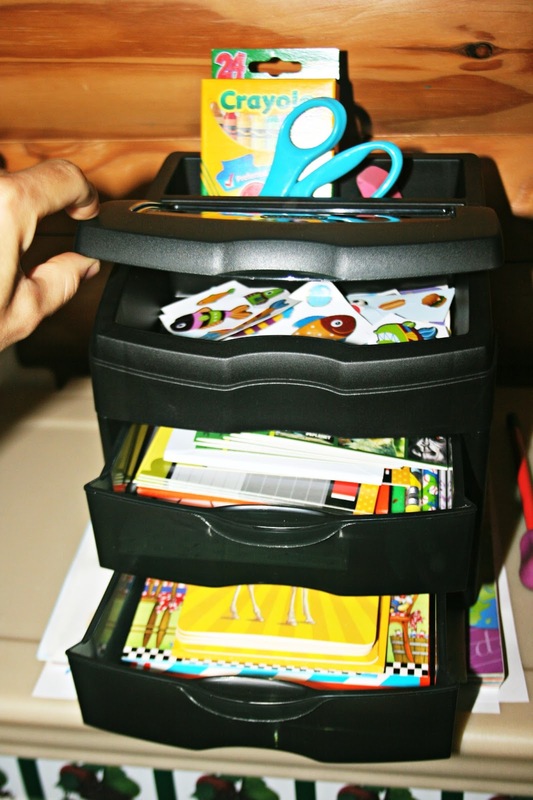 I found a nice little cubby with three drawers and a "sticker compartment" to organize his letter writing supplies. Readers, do you still write letters? I wrote letters all the time growing up - to relatives and friends. Now, I just seem to email. I am afraid letter writing (even the act of writing) is a dying art. I love letters! Although, I am mostly an e-mail girl at this point. I try to write letters to some friends monthly, but it isn't as often as I like. I was taught to put my finger at the end of each word before writing the next word to create the necessary space. Maybe that would help Pierce. I think that is great he writes letters. I think people appreciate getting a handwritten letter/note. i do it all the time - i have a lots of shut-ins, church friends & regular friends all who i enjoy sending notes & cards to all through the whole year. i love it. usually special occasional like their birthdays or other important must not forget days. Sad to say, I dont write letters any longer, but email 99.9% of the time. I do send post cards however, for the 'postcrossing' group, and I send get well, happy birthday and friendship cards to friends and family. I am not a letter writer. I do love that Pierce is. What a wonderful writing area you have created for him. I rarely write letters any longer but when I was younger, it was great fun. I cannot remember the last time I wrote a letter. I like the system you set up. I absolutely did, and I did it a lot! Even after I got married, I would sit on the couch with my stationery and watch tv and write letters! How wonderful that Pierce writes letters! I'm neither a letter writer nor e-mailer. That is so cute. And a great skill to enjoy. Especially for the letter receivers! We write letters! And my kids HAVE to write thank you notes and get well notes when the occasion requires. Glad to hear your Little One enjoys writing letters. Neat Mom idea getting Pierce his own letter writing station. At 32 I still love stickers! I like to send greeting cards for special occasions. My cards are frequently embellished with ... stickers! I love to write letters, but i rarely do so. E-mail is so much more convenient. It's wonderful that Pierce loves to write them! Maybe it's not a lost art after all. I used to love receiving letters when I was a young girl. Writing them was also something I liked to do... Now it's mostly the instant gratification of e-mail, except for thank you notes, which I believe should still be hand written and snail mailed. So good that your son likes writing, I hope many others do as well, it's an art, and a more personal way of keeping in touch. I love that kit you put together for him. That's such a great idea. I need to have Hailey do that more. The grandparents always love a note from here, even if it's just a picture she drew. That is so neat that Pierce like to write letters. The recipients of those letters must appreciate his sweet words. I used to be a letter writer. Now, not too often. My handwriting is so bad--worse than it used to be--that if I do write a letter, I usually type it on the computer and print it out. How handy is that? We love the $1 isle at Michael's! I haven't written one in a couple decades, if it weren't for bills, I would cut down the mail box. That is so cute! I love that he likes to write letters. I honestly don't remember the last time I wrote a letter, but I do send out cards to family and friends quite often. I usually just email if I have something longer to say! This touches my heart, I am still a letter writer and have my own kit, my first came from my Mom who made me one out of an old wooden japanese orange box 57 years ago, lucky Pierce and very creative Mom. My wife and I lived on letter before we were married and before either of us could afford long distance! It's great to get a letter still so I Pierce will always enjoy! There is nothing like getting a letter with a person's own handwriting! It is a wonderful thing, to know they thought enough of you to actually spend for the stamp and go out and mail it. I have always loved letter writing and have written plenty of them in my day. I would have died and gone to Heaven if someone would have gotten me this when I was little!! !t is just perfect, and will encourage his letter writing even more. I love the cute and funny mistakes kids make in their letters, too bad we have to teach them to be all proper!! You are such a good mom. Love it! I wrote letters all the time when I was growing up,all the way up until email, and even then continued corresponding via snail mail with my grandmother until she died. Sigh. I treasure the ones from her. I hope people write back to your son. How cute! I hope he sticks with it ;) I was never much of a letter writer but did enjoy having a few pen pals when I was young and guess that it why I enjoy blogging... in some ways similar but different too. That is so great you are encouraging him to write real letters. I would love to get letters from my grandchildren. I have hinted but its not working. Hope you have a great week. I e-mail mostly, but do send cards that I make out of my photographs. Really great that you are promoting Pierce's letter writing habit! Love it! I never write letters any longer either and it is sad. The invention of the computer and internet have made us lose that part of our life.... But I feel at least I email. I love to write letter and receive them...but I don't much anymore. Isn't that sad? Remember how fun it was to get an actual letter in the mail???! Wow. Wish we'd go back to that again. Good for Pierce bringing it back in style! Gosh Lisa - he loves to write - that is a blessing!!!!!!!!!!!! It's lovely that he likes to write! I pretty much just email now. I try to encourage my kids to write mail. I need to get better at it. Their grandparents would love some mail. I forgot about the whole space between words concept! I remember working on that with Amy! Amy is a big believer in writing letters. I like the idea, but I tend to email more often than not. That is just so sweet. I don't write many letters these days but I do send a lot of cards out. Such a great little cubby for him!